HONG KONG, May 10, 2017 - (ACN Newswire) - The HKTDC Hong Kong International Medical Devices and Supplies Fair (Medical Fair) will take place at the Hong Kong Convention and Exhibition Centre (HKCEC) from 16 to 18 May. The largest Hong Kong medical fair organised to date, the eighth edition of the fair will gather 270 exhibitors from 14 countries and regions to showcase the latest medical equipment, technology and related services - providing a one-stop business platform for the medical industry. The three-day event is being organised by the Hong Kong Trade Development Council (HKTDC) and co-organised by the Hong Kong Medical and Healthcare Device Industries Association (HKMHDIA). Johnny Wan, HKTDC Exhibitions Market Development Director, said Hong Kong's total exports of medical and healthcare equipment reached HK$12.8 billion in 2016, an increase of 8.1 per cent over the previous year. The export value of such products in the first three months of this year reached HK$2.9 billion. HKMHDIA Chairman Ir Dr Andros Chan added that global demand for medical devices and supplies continues to rise. "According to the World Health Organization, annual global health expenditure is estimated at around US$6.5 trillion. Health expenditure as a share of GDP continues to grow in all major economies, including the Chinese mainland. This indicates immense market opportunities." The Medical Fair is an effective trading platform for the industry to grasp the business opportunities in this fast-growing market. This year, the fair will welcome new group pavilions from the US state of Illinois, the Czech Republic, India and Poland's Wielkopolska region. Returning pavilions include the Chinese mainland's Ningbo city, Pakistan and the HKMHDIA pavilion, which comprises about 30 companies. Exhibitors from Korea, Singapore and Thailand will also make their debut at the fair, further enriching the variety of medical equipment and devices on show. Last year's fair was well received, with more than 10,000 buyers taking part. This year, 38 international buying missions organised by the HKTDC are expected to bring in more than 1,000 buyers. The Medical Fair will feature a wide spectrum of medical and healthcare equipment and related services, organised into more than 15 specialised product zones for easy sourcing. Responding to growing awareness of the importance of healthcare, "World of Healthcare" will be introduced at the fair to present healthcare products and services, including fitness products, health food and beverages, and nutrition supplements. The medical industry is also becoming a popular sector for entrepreneurs. In line with the government's policy to promote entrepreneurship, the fair will feature a new "Startup" zone, to showcase innovative medical products from Hong Kong start-ups. "In recent years, many young entrepreneurs are dedicated to developing medical products and technologies and bringing new products and ideas to market. Therefore, the Medical Fair is introducing the Startup zone to connect them with buyers and potential business partners and explore more opportunities," said Mr Wan. According to the United Nations, the total global population is estimated at around 7.5 billion people, with 960 million or 13 per cent of the total population aged 60 or above. To keep pace with rising demand in the "silver market," the Rehabilitation and Elderly Care zone will showcase products and services for general care and rehabilitation after illness or injury among elderly people. Products to feature include an exercise machine equipped with various muscle-training programmes that improves respiratory and cardiovascular system functions of patients with Parkinson's disease, as well as an innovative tank-top developed by the Hong Kong Polytechnic University. The vest features a bio-feedback system with multiple sensors used to treat scoliosis. As household medical products and services grow more popular, many companies have launched products specific to the household market. The Household Medical Products zone, another fair highlight, will showcase various household medical devices, including an electrocardiograph smart watch band that can facilitate immediate diagnosis and treatment of heart disease. With new innovations in medical technology, there is growing demand for diagnostic and surgical equipment. The Hospital Equipment zone will showcase specialist equipment and technology, including ultrasound and imaging tools, as well as a range of surgical instruments. The fair's Physiotherapy zone will present the latest physiotherapy equipment, devices and related services and products, including a therapy mattress, therapy light, physiotherapy plinth and physiotherapy massage equipment. To help industry professionals monitor the pulse of the market and expand their business networks, a series of seminars will be held at the fair. Industry experts will discuss topics ranging from the latest market trends and product innovations to worldwide medical device regulatory updates. The Czech Republic pavilion, participating in the fair for the first time, will also invite professionals to present an overview of the Czech medical market and their latest medical equipment and services. Three workshops, co-organised by the Hong Kong Doctors Union and the Hong Kong Health Care Federation, will cover such topics as cervical cancer prevention and HPV infection, and the latest information on coronary angioplasty. The Medical Fair has strong synergy with the concurrent Hospital Authority Convention 2017, to be held on the first two days of the fair (16-17 May). More than 5,000 delegates are expected to attend the Convention, making it one of Asia-Pacific's largest events for medical professionals. 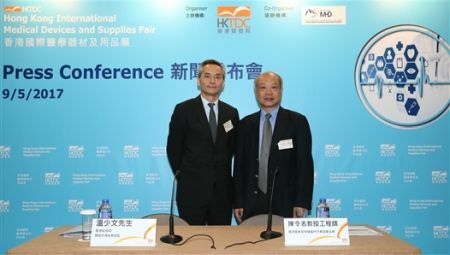 (Photo:) HKTDC Exhibitions Market Development Director Johnny Wan (Left) and HKMHDIA Chairman Ir Dr Andros Chan (Right) introduced highlights of the Medical Fair at today's press conference.